If you’re an active Lynk driver you now have the opportunity to get 1 Month Base FREE by referring a new driver. Get in touch with your driver friends on the ranks, in your Whatsapp groups or in the pub and get them to sign up with Lynk! How do I get 1 Month FREE? Ask your buddy to take a two week FREE trial. That’s on the house!! When your buddy stays and pays with Lynk for 4 weeks you’ll get 1 Month base FREE. 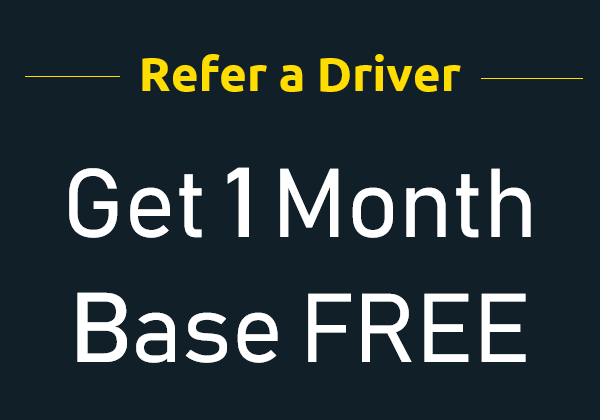 Its simple, bring in a driver and when they stay for 4 weeks you’ll get 1 month without paying base. That’s 1 full month of base free driving!! You also get to decide which month you take for free. Example: Refer in April & take your free month in September.